Today we’re talking combination plays, a trend in volleyball that seems to be becoming more and more popular. A combo play happens when the offense puts two attackers in the same area in hopes of confusing the block. The setter knows where she is going with the ball, but on the other side of the net the defense will see multiple options to defend. This is an in-system play as it requires a perfect pass. A/Pipe: This combo throws a lot at a defense. The A set is a quick-tempo set to the middle attacker. With a team in system there isn’t much space between setter and attacker, so it comes at a defense quick. The Pipe set is a back-row attack up the middle. It takes longer to develop, but varying the tempo is a good thing, too, as the defense has to be ready to put up a block for both types of attack. B/Go: In this combo the setter has two options right in front of her. 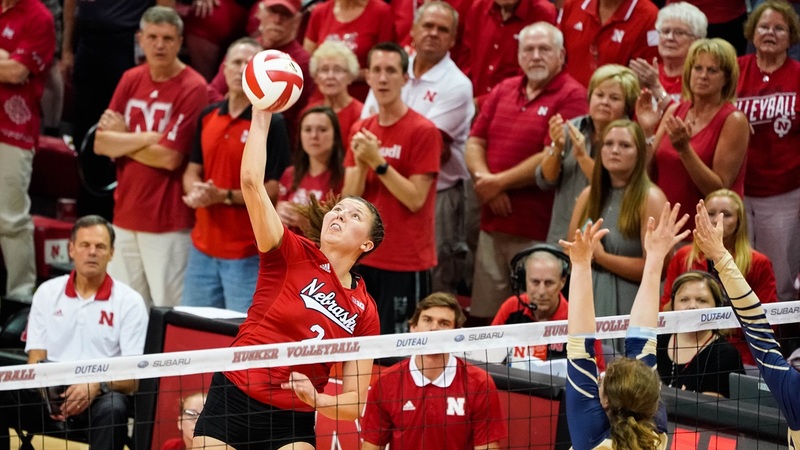 She can go with the B set, a wide but still quick set to the middle attacker, or she can opt for the Go set, a quick-tempo set to the outside hitter at the pin. No combo needed? Freshman Jazz Sweet goes to work against the Minnesota block. C/Jet: This combo forces the defense to deal with two attackers behind the setter. The C set here goes to the middle attacker, while the Jet set is a quick-tempo set to the right-side hitter at the pin. The goal with any combo play is deception. If the offense can slow down the block it can be left with one-on-one or, even better, one-on-none attacking situations if the defenders bite on the fake. You won’t see Nebraska use combo plays that often. That’s because the Huskers are confident in their hitters to beat the block out of the basic offense. To run a bunch of combo plays, which require intricate footwork and timing, could only complicate matters, but you will see Coach John Cook call one if a particular rotation is struggling and he feels like the team needs a spark. But most of the time Nebraska will bet on its execution of a basic play to get a point rather than the deception of a combo play. 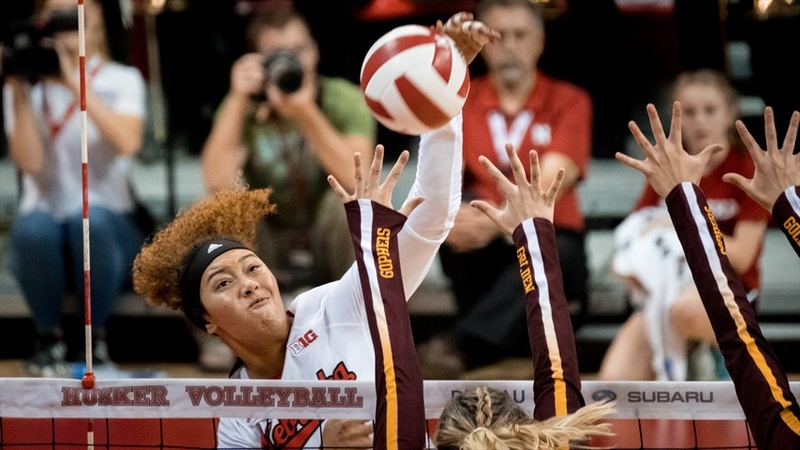 There are plenty of teams in the Big Ten and throughout the country, however, that make it a regular part of their offense and that group continues to grow as the sport evolves.